There is nothing wrong with feeling overwhelmed by the clutter in our lives. But there can be a fear of judgment and embarrassment that stops many of us from getting the help they need. Well, it's time to get past those feelings and finally live a simplified life! I offer a compassionate, caring, non-judgmental approach to help you get your home and lifestyle in order. In my years in this business, I've learned there is no one-size-fits-all organizing plan that will fit everybody’s home and lifestyle. Being organized isn’t a gift that only some of us are born with; it is a skill that can be taught. So many people struggle with organizing their lives. It's my passion to use my nursing skills and love for organizing to help them live a life that is streamlined and clutter-free. You just need the tools to find the root of the problem and fix it. It's time you learn to rethink about your relationship with your things. You need to take stock of your current stage in life, and how to get to a place where you are ready to make lasting, positive change. As a professional organizer, I don’t just tidy up, I discover the cause of your clutter, working with you to overcome your barriers to an organized, calm life. I teach busy families like yours how to create systems that will keep them organized long after my visit. And if your hectic life gets in the way of that goal, don't worry! You can always schedule me to come back for regular follow-up visits to ensure your home stays organized, neat, and clean. 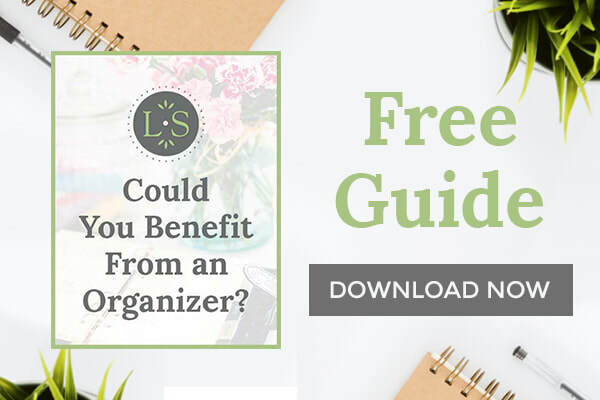 Need some help getting organized? Check out our free resources!